USS Benton County (LST-263) was one of several Landing ships built during WWII, named after locations in the Pacific Northwest. Like the rest of the LST, it wasn’t directly named for just one county though. There are Benton Counties in Arkansas, Indiana, Iowa, Minnesota, Mississippi, Missouri, Oregon, Tennessee, and Washington, so for our purposes it could be on this list twice! 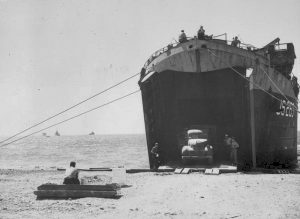 According to official records LST-263 was only in one action, but did a bit of work transporting troops to the battle fronts in Italy and France. Over 1000 LSTs were built for use in WWII. They were designed to drop off tanks, trucks, artillery and troops onto beaches in amphibious operations. This they did around the world through several wars. LST-263 was one of 120 LSTs built by the American Bridge Company in Ambridge, PA. She was laid down September 7th, 1942 and launched four months later on February 27th 1943. She was “sponsored” by Mrs. Charles G. Baumgartner, whom seems to have disappeared from history. LST-263 was then commissioned on June 20th 1943, and assigned to the European Theater. As part of Convoy UGS-37 she crossed the Atlantic Ocean in Spring 1944. It is unclear what she might have carried during that time, but I imagine whatever it was, she was full! 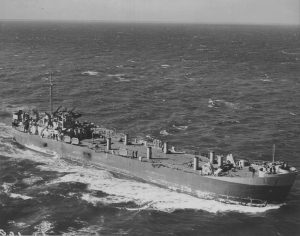 As a LST, she is not listed on any Convoy listing that I can found. 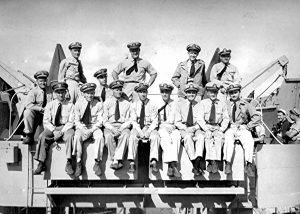 UGS-37 sailed from the Hamptons on March 24, 1944 to Port Said, Egypt, arriving on April 19, 1944. I assume that was the assembly point for the invasion of France in August and September 1944. It appears that LST-263 started transporting troops and supplies to the Italian Battlefront. Her first major stop looks to have been Naples. She was the first LST to land at the port of Civitavecchia, Italy, 40 miles Northwest of Rome in June 1944. Despite the Royal Navy clearing a path through ship wrecks in the harbor, they still had to guide the LSTs in. Her next stop was Palermo, Sicily in August 1944. From the Unit History of the 214th AAA Bn, Sept. 1944. 2 September 1944, Batteries alerted for loading on to LSTs at Ajaccio, Corsica, A & B Batteries on LST-263. Left docks about 1530 and sailed from the harbor at 1800. CO and. S-3, 406th AAA Gun Bn saw us off. Fresh meat for supper. 3 September 1944, Sea journey to St. Tropez, France. windy and rough. Anchored in harbor about 2030. After a rather boring (at least on paper) trip to France, it looks like she transported wounded soldiers and continued to drop off supplies to both the French and Italian fronts. With the end of the war, she was laid up as part of the Reserve Fleet on May 29th 1946. In 1955, for reasons I’ve yet to find, all the LSTs were given proper names. From July 1st 1955, until she was struck from the Naval register and disposed on November 1st, 1958, she was known as the USS Benton County. Her post war fate is unknown – but is apparently covered in World War II U.S. Navy Vessels in Private Hands: The Boats and Ships Sold and Registered for Commercial and Recreational Purposes Under the American Flag on pg 77. I have not been able to secure a copy of this book though, so have not been able to find out what her ultimate fate was. If you know, (or have a copy of this book,) please comment below! Click here to see more Navy ships named for Pacific Northwest Locations.
. She was registered by the TMT Trailer Ferry, Inc., of Jacksonville, Florida, in 1972, as the TMT Puerto Rico, a 3,228-ton freight barge.